The head judge cleared his throat and called the journalist. As soon as he pronounced her name, “Seda Taşkın,” in his high-pitched voice, a look of incredulity spread across the faces of the handful of people watching the trial in the austere courthouse in Muş, a small town in Turkey’s far east. One lawyer, startled, dared to point out the unexpected sequence of words: “Did you just call her ‘Seda?’” Rıdvan Konak asked. For the first time throughout the trial, the judge’s impassive eyes betrayed a glimpse of nervousness. It must have dawned on him: During the previous hearings, he had insisted on calling her “Seher,” the name on her ID card. After all, the prosecution had claimed that “Seda” was nothing but a code name for her allegedly illegal activities. In fact, Taşkın’s purported code name was the sole shred of ostensible evidence for the prosecution’s charge of “membership in a terrorist organisation,” and the judge was absent-mindedly throwing it away. A faint and uneasy smile formed below his thin moustache. “You thought all along that we were fixated on that, but we were not,” he managed to reply, looking awkwardly at lawyers from his raised platform. It was an explanation he mumbled aloud twice – just like a little boy caught in fraganti trying to convince his parents that he wasn’t misbehaving. It was also an odd excuse given that the court had twice refused to release the journalist on the grounds that more evidence was needed to prove that all her family and friends had called her “Seda” since she was a toddler. Yet a hopeful question popped up in everyone’s mind. Could this slip of the tongue be a good omen? The fact the head judge so naturally ended up calling the journalist by the name everybody used showed how much regard the court paid to the accusations levelled by the prosecution. The journalist’s lawyer, Ebru Akkal, said distorted evidence and interpretations were common in free speech cases. “But in Seda’s case, we are dealing with blatant lies,” Akkal said. Taşkın, a reporter focusing on culture, education and women’s rights, was accused of sharing articles on her social media accounts – none of which were written by her. And it did feel as though Taşkın was being personally targeted by the anti-terrorism unit of Muş in light of the massive rights violations she experienced from the moment of her arrest, including a fabricated tipoff, physical and psychological ill-treatment during custody, threats, as well as blackmail. Nevertheless, Akkal said they expected Taşkın’s release until the very moment that the verdict was pronounced. The judges overseeing the case, however, opted to change the goalposts at the last minute, suddenly and arbitrarily replacing the original accusation with the vaguer charge of “aiding a terrorist organisation without being a member.” The court also refused to provide any additional time to the defense to object to the charge as required. “I think that the court was convinced that Seda had nothing to do with a terrorist organisation. But they needed to find a charge because they couldn’t let any individual who got into the authorities’ grip go without a sentence,” Akkal said. The court eventually handed Taşkın four years and two months on the charge of “aiding a terrorist organisation without being a member” and three years and four months on the charge of “conducting propaganda,” adding up to a total of 7.5 years in jail. The journalist, who has already spent 10 months in pre-trial detention at the Silivri Prison in Ankara, will remain in jail during the appeal process. Taşkın was forced to make all her defense statements via video-conference broadcast on a screen inside the courtroom 1,000 kilometers from the capital. The court had already buried police irregularities by refusing to investigate the identity of the person who gave the tipoff despite repeated requests by lawyers. The extension of the email address in the files, which authorities neglected to black out, clearly indicated the tipoff came from a member of the police department. The judges also refused to heed Taşkın’s long account of the abuse, strip searches, beatings and threats she suffered. But by sentencing her, they have closed the case with a minimum of fuss for the police and the prosecutor. Taşkın’s lawyers expressed indignation at the court’s handling of the case, describing it as blatant bias. “If the judges are to wash the prosecutor’s hands and the prosecutor, in turn, the police’s hands, why not just let the police run the investigation and issue a verdict?” Akkal said. Only two years ago, Taşkın was thrilled when she learned that she had been appointed to the eastern city of Van by the pro-Kurdish Mezopotamya News Agency. She thought that her new position in the agency’s second largest regional office would give her invaluable experience as a journalist in a much tougher environment. The decision also meant leaving her family home in Ankara for the first time in her life. Her parents, however, were concerned about her plans, since journalists working in Kurdish provinces have become even more vulnerable to arrests and detentions since authorities declared a state of emergency in 2016. She possibly chose the most difficult context possible to work “in the region,” as many reporters in the field refer to the Kurdish southeast. The crackdown on Kurdish media intensified during a military assault that was launched in the winter of 2015 and peaked under the state of emergency clampdown. Many journalists were tracked, investigated, threatened and some, such as Nedim Türfent, jailed and charged with terrorism offenses. 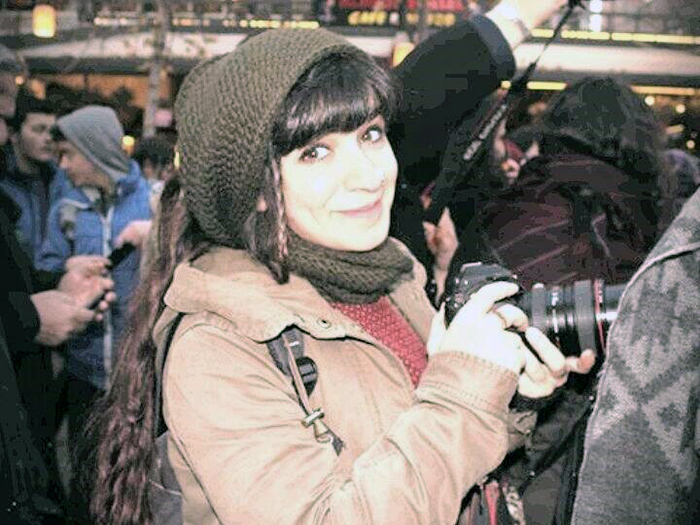 Ultimately, Taşkın’s motivation and determination won her family over, and the young journalist went to begin her work. In Van, she felt empowered to express her personality, especially when covering stories that were colourful or touching more so than merely political. “She was eclectic. Her sensitivity and inner conscience allowed her to report on universal subjects such as ecology or women’s issues,” her sister said. She toured villages around the Van Lake, met local people and developed her passion for photography to such a degree that she didn’t want to go back to Ankara. Then, one day in December 2017, her agency sent her to Muş to report on as many articles as she could. It was Taşkın’s first time in the rural and conservative province. She travelled first to Varto, a former Armenian town populated today by a majority of Alevis – a community whose belief system is often labelled as a heterodox and progressive form of Shia Islam – who had fled Dersim during the state-perpetrated massacres of 1938. Dersim, today called Tunceli after the name of the Turkish state’s military operation, is also the hometown of Taşkın’s family. After reporting on the newly established culture and solidarity association in Varto, she returned to the provincial center, a place firmly under the control of the police. The ruling Justice and Development Party (AKP) had won the municipality over the pro-Kurdish Peoples’ Democratic Party (HDP) and kept the city under strict state authority. She would be arrested shortly thereafter. Taşkın’s case followed the same trajectory. Among the several reports she was covering, Taşkın met with the family of 80-year-old Sise Bingöl, who has been in jail on terror charges since 2016 despite suffering from heart and lung disease. The recordings of her interview with Bingöl’s relatives, which were found after Taşkın was arrested, were used as evidence in the trial even though the journalist never published them. Once she was taken in custody, police seemed to have dissected her Facebook and Twitter accounts to find any post that could make a terrorism charge admissible in the eyes of the Turkey’s ever less independent judiciary. Taşkın’s former colleague Hayri Demir, a journalist based in Ankara who followed the last hearing in Muş, stressed that social media posts containing news reports should be considered as a journalistic activity in itself. “Social media has become a publishing space for journalists. It’s a space where journalists share their own and their colleagues’ articles,” said Demir, who himself is facing 10.5 years for five tweets – all of which lacked any personal comment – on Turkey’s military operation against the Syrian town of Afrin in January. Accusing journalists of sharing other people’s news articles also violates the individuality of criminal responsibility, a critical principle of modern criminal law. But aside from the dubious practices of the authorities, there was one aspect to Taşkın’s case that seemed to amount to psychological harassment: The symbolic dates of the hearings. The second hearing of the case was held on 2 July, the 25th anniversary of an attack by an extremist mob in Sivas that killed 33 Alevi artists. The third hearing was set on 12 September, the anniversary of the 1980 coup, which resulted in imprisonment and torture for thousands of left-wing and pro-Kurdish activists. The fourth and last hearing was on 10 October, the third anniversary of Turkey’s deadliest-ever terrorist attack, which the Islamic State perpetrated against peace activists in Ankara. As for the date of the first hearing, 30 April, that happened to coincide with the liberation of Muş from foreigners after World War I. The verdict will become definitive if the regional court rejects her appeal – and because Taşkın’s sentences are each under five years, she will not have recourse to the Supreme Court of Appeals if the lower court rules against her. Regional courts are hardly known for their initiative, but both lawyers and taşkın retain their hopes for a rare fair reassessment of the case. In the meantime, lawyers have applied to the Turkish Constitutional Court to halt the execution of the sentence based on a precedent for journalists Mehmet Altan and Şahin Alpay. In January 2018, the Constitutional Court ruled that the imprisonment of both journalists not only violated their right to security and freedom but that there was not enough evidence to hold the men. Although first instance courts controversially refused to implement the decision, the pair was released at the end of a legal row months later. Taşkın’s lawyers are also preparing to file an application at the European Court of Human Rights, although Akkal noted that it will take at least a year for either of Turkey’s top courts to make a decision. Taşkın, meanwhile, may face years in prison waiting for justice to be served. “After the initial shock of the verdict, she is now calm. She is trying to spend her time productively,” Akkal said. Her sister Yelda said Seda had started to learn English in prison and was reading lots of books. “We were expecting her to be released in each hearing. But we would like anyone who is unfairly imprisoned to be free,” she said, adding that Seda has tried to remain conscious of the fact that she is not the only journalist in jail. Indeed, during her defense, Taşkın not only called for her release but expressed her wishes that all her colleagues would walk free – an expression of human solidarity against organised unlawfulness that has riddled the law, one unjust sentence at a time.